Don't generate more clutter with the HUGE 58 INCH USB cable which is included with Roku. At about 8 inches, this USB Cable is the ideal length to power your Roku 3600R Streaming Stick (HDMI) Player from the TV USB Port. Our convenient USB Power Cable connects your Roku to your TV's USB port. 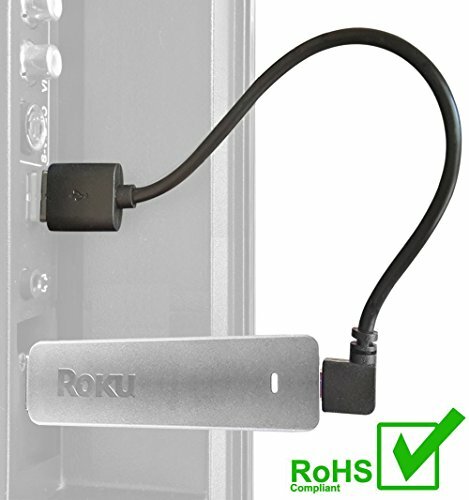 Our 90 degree connector is designed to minimize the length of cable required to connect your Roku to your TV which reduces the amount of clutter behind your TV. Purchase your USB Cable with a complete peace of mind as we offer a 1 year unconditional warranty on this USB Cable. Prior to purchasing this cable, please make sure that your TV has a USB port on it. We constantly get asked if this cable can be used with other devices. The answer is Yes! As long as your device is compatible with a Micro-USB Cable, then you can use this cable to power your other devices including smartphone, battery pack, ezcast m2, and more.